The Gamma Psi chapter of Phi Beta Sigma Fraternity, Inc., is pleased to announce their Blu Thousand 03 Blizzard Week on the Rust College campus. Project B.L.I.Z. (Business Leaders Incorporating Zest) will be held during the week of January 19-25, 2003. The highlight of the week will feature the 1st Annual Blu Blizzard Stompfest on Saturday, January 25, 2003, at 7:00 p.m. on the Rust College campus at the W.A. McMillan Multi-Purpose Center. K-97s Devin Steele will host this event. The members of the Gamma Psi chapter of Phi Beta Sigma Fraternity, Inc., will attend worship service at the Anderson Chapel CME Church on Martin Luther King Dr. in Holly Springs. The men of the Gamma Psi chapter of Phi Beta Sigma Fraternity, Inc. will be hosting a Blu Blizzard Kickoff Social. This dessert social will officially kickoff Blu Blizzard Week on the Rust College campus. This event will be held from 7-9 p.m. at Studio 1866 on the Rust College campus. This is a casual event and dress code will be strictly enforced. At noon, the men of the Gamma Psi chapter of Phi Beta Sigma will be releasing 89 balloons to commemorate the 89th anniversary of Phi Beta Sigma Fraternity, Inc. Later that evening, the Gamma Psi chapter will host Kiss From a Sigma: A Tribute to a Black Woman. This event will be held at immediately following the basketball game between Rust College and Arkansas Baptist College at Studio 1866. This event is for ladies only. The Miss Phi Beta Sigma pageant will be held at 7:14 p.m. in the Morehouse Auditorium inside the Doxey Alumni Fine Arts Building on the Rust College campus. Eight contestants will be vying to become the next Miss Phi Beta Sigma. Admission is for this event is $1.00. Sigma in the Basement will be held at 8:00 p.m. in Heard Auditorium inside the McCarthy-Varnell Business/Computer/Social Science Building on the Rust College campus. Admission for Rust College students will be $1.00. The 39th Annual Gamma Psi Assembly program will be held at 2:40 p.m. in the Morehouse Auditorium inside the Doxey Alumni Fine Arts Building on the Rust College campus. Marcus Cheaney, state director of Phi Beta Sigma Fraternity, Inc. will be the guest speaker. During the program, a scholarship in the amount of $2,000 will be awarded to one of four possible recipients. Later that night, the men of the Gamma Psi chapter of Phi Beta Sigma Fraternity, Inc. will throw a Blu Kickoff Party at the Zeta/Sigma Complex in Holly Springs, Miss. Doors open at 9:14 p.m. Admission will be $3.00 before 10:30 p.m. After 10:30 p.m., admission will be $5.00 with college ID. Devin Steele of K-97 FM in Memphis, Tenn. will be the DJ for this party. Proceeds from this event will go to Project S.W.W.A.C. (Sigmas Waging War Against Cancer). The men of the Gamma Psi chapter of Phi Beta Sigma are encouraging the Rust College family to wear their Blu and White outfits to support Phi Beta Sigma Fraternity on the Rust College campus. Members of the Gamma Psi chapter of Phi Beta Sigma will be on hand to serve lunch to student of Rust College during lunchtime. Also during lunchtime, there will be a drawing to win free tickets to the Blu Blizzard Stompfest. The members of the Gamma Psi Chapter of Phi Beta Sigma Fraternity, Inc. will be hosting a cookout on the Rust College campus. This event will begin at 11:00 a.m. at Studio 1866. K-97 FM will be broadcasting live at this event. This event will be held at the W.A. McMillian Multi-Purpose Center on the campus of Rust College. The host of this event will be Devin Steele of K-97 FM in Memphis, Tenn. Admission for this event are $5.00 for Rust College students; General college and high school students $7.00; and the general public will be charged $10.00. The official after party of the Blu Blizzard Stompfest will be held at Dreamland on Martin Luther King Drive in Holly Springs. This event will begin at 9:14 p.m. You must be over 18 to attend this party. 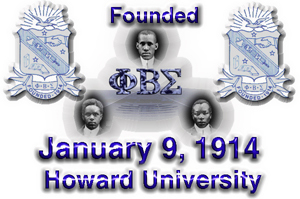 Phi Beta Sigma Fraternity, Inc., an international organization of college and professional men was founded at Howard University, Washington, DC in 1914. One of the nine largest predominately African-American Greek-letter organizations, Phi Beta Sigma has a membership of over 125,000 with 650 chapters throughout the United States, Europe and Africa. Visit www.pbs1914.org for more information about Phi Beta Sigma Fraternity, Inc.